Learn all about Juicing at relaxingnaturalhealth.com. Here is a question from one of my email friends, with my answer. We both have the Jack LaLanne juicer. Now about the juice--what does Bob mix it with? Sounds good and very nutritious! Rick bought me a Jack LaLaine juicer which I don't use because I think its a pain to clean. Plus their recipes didn't make me very happy. Send some ideas please. Bob makes two kinds in one session--green shot and orange/carrot. These 2 are delicious, separately, but gross when you put them together. 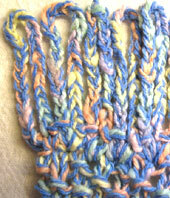 Even the color is yukky when combined, but pleasing when you do them apart. Bob does green shot, first. Break off the bottom of the parsley stems. Roll parsley and spinach into a ball and jam it in. When we have a garden, we use kale instead of spinach. It doesn't taste as good, but it's so easy to grow and grows all season long and we know it's better for us just because it's fresh from the garden. I'll have to research spinach--find out if it's as bountiful to grow and see which has more food value. After we've had our green shot cocktail, he makes the orange/carrot juice for "dessert." We do them in that order because the orange/carrot juice tastes better. I like the green shot, too, but some people don't (and I don't with kale instead of spinach). Yes, juicing takes a long time and cleanup is a pain. OTOH, the by-products are great in the compost. When we don't have greens from the garden, the produce takes up a lot of valuable real estate in the fridge. Greens don't keep long, which is another problem when we only shop twice a month. Also, you're not supposed to store juice. You're supposed to do it every day to get full benefit. We cheat and make 2 day's worth at a time, but who knows if it's really doing any good by the 2nd day. Also, it doesn't taste nearly as good by the next day, or even the next hour. When they say drink it fresh, they mean RIGHT NOW.